I love watching a Reddish Egret hunt. They run around in all directions with wings spread striking at whatever catches their eye. 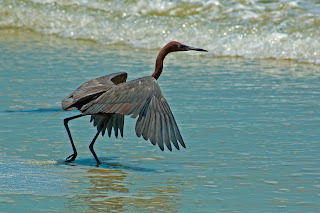 This is one of the rare times I've seen one hunting in the surf, I usually see them on the shallow mud flats at Ding Darling or or similar habitats. I took the photo at Ponce Inlet near New Smyrna Beach which is a great place to find snowy egrets and small shorebirds hunting on or near the jetties.